Posted on May 16, 2016. Filed under Association News. Be the first to comment. 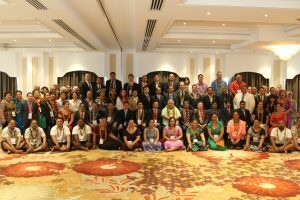 Over a hundred ADFIAP members, partner-organizations and invited guests convened in Apia, Samoa on May 2-5, 2016 for the 39th ADFIAP Annual Meeting with the theme “DFIs: Building Partnerships for Climate Change Resilience.” The event, hosted by the Samoa Development Bank (SDB), the Samoa National Provident Fund (SNPF) and the Samoa Housing Corporation (SHC), was keynoted by Hon. Auelua Fatialofa Lupesoliai Tuilaepa Sailele Malielegaoi, Prime Minister of the Independent State of Samoa. As climate change is becoming a big concern and challenge which significantly affects many nations, including small islands countries and territories in the Pacific, this year’s conference theme is timely as it is relevant. The conference covered six (6) plenary sessions where various topics and issues revolving around the theme were discussed and dissected by speakers from the invited guests and ADFIAP members who shared their insights and knowledge. Session 1 covered enhancing of regional cooperation for climate change resilience; Session 2 discussed policy framework and sustainable partnerships to enable coordination of climate change initiatives; Session 3 tackled DFIs engagement in addressing a green economy, poverty reduction and inclusive development; Session 4 dissected creating an enabling environment to facilitate access to finance and financial cooperation; Session 5 covered SMEs: enhancing their role and contribution for sustainable development; and Session 6 discussed the roadmap for the 2030 agenda for sustainable development. Other highlights of the event were the General Assembly Meeting, the 83rd ADFIAP Board of Directors Meeting, the Delegate-Meets-Delegate session, the welcome dinner and Awards night and the drafting of the “Samoa Declaration”, a set of action plans for ADFIAP and its member-DFIs that are aligned with the topics presented and discussed during the annual meetings. The ADFIAP annual meetings, which is held in different cities around the region, serves as a platform for the ADFIAP members, partner-organizations and other DFIs to share best practices, ideas, knowledge as well as a place for them to network, do B2B meetings, and tackle relevant issues.